Six days before the release of the iPhone 4, a camper has already been spotted in the wild, braving the heat in anticipation of . . . a cell phone. 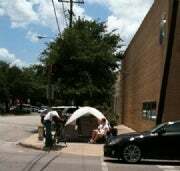 A man named Justin set up a provision-packed tent outside of the Knox Street Apple Store near Dallas. Let's hope Justin has a lot of water: according to Weather.com, the temperature in Dallas is supposed to hover in the 98 degree range for the next six days. Justin's photo first appeared on the Dallas Morning News tech blog. Once the "fame" started pouring in like southern sweat, Justin posted on MacRumor's message board, offering reasoning for his extended stay on the blistering concrete. "Some would say I am crazy, but I say I'm a very determined fan," Justin wrote. He added that due to a disability, he is currently unemployed and out of school; therefore he has time to waste spend outside of an Apple Store. Most surprising of all, Justin pre-ordered the iPhone 4, so there's no tangible logic to his camp-out other than as a vacation of sorts. "I'm doing it for a fun experience. I haven't had a trip or vacation in past 10 years so I figured I make it a full week camping trip," he wrote. Perhaps a sidewalk is a better vacation destination than the woods: there's a porta-potty out back! I think Android fans should get in on this action. Forget the iPhone 4 -- Android is where it's at. In five days, a slew of Android phones -- including the drool-worthy Droid X -- are set to be announced. Loyalists should start pitching tents (keep it clean) outside of the Mandarin Oriental in New York for the big Verizon Wireless media event. Or, perhaps, since this is just an announcement and not a release, Android fans should simply sit on their front lawns, thighs burning from overheated laptops, foreheads blistering in the sun, and broadcast their solidarity to the Great Google. Or maybe we should all just pre-order this stuff online.